Out of disgust for the notion that God had to kill Jesus in order to somehow "satisfy his wrath"--because somebody just has to die if God's going to forgive and save the world--some people become disgusted with the cross altogether. I share this disgust. And I share their deep obligation to critique such a strange notion. But I don't share their reaction. They see the crucifixion of Jesus as an unfortunate end to a beautiful life with no meaning in and of itself and they put all the weight of meaning on the resurrection alone. They strip Jesus from their crosses out of their overarching rejection of substitutionary atonement and they place him eternally at the open tomb of the resurrection. Thus, they perpetuate the cursed-ness of crucified people, which God rejected when he went to a cross himself, and they give way to the assumptions that sometimes even lead to what's called "prosperity gospel" where it's hard to imagine what Jesus may have meant by "take up your cross and follow me." Because they can't stomach the idea of a God who needs to kill somebody in order to forgive (and who can stomach such an idea? ), they sometimes downplay or even skip over the cross. The cross is indeed a climactic moment in history, not because God had to kill somebody and not because he had to die in order to forgive but because he died in order for forgiveness to give life to freedom and new creation. 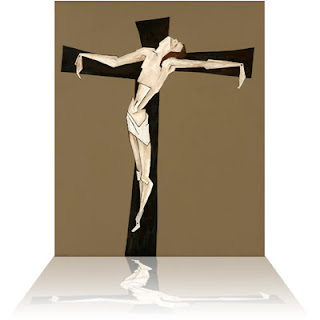 In the crucifixion, Jesus brought God to a cross--throwing the whole "order of things" out of whack and flipping the "social order" on its head--to share solidarity with the crucified and to thereby "take the sin of the world upon himself." He didn't take the sin of the world upon himself in the same way many people talk about it; as though he's taking the bad stuff that I do and paying the price for it in order to satisfy God's wrath. Rather, he's taking the sin of the world upon himself insofar as he is letting death (the culmination of sin and curse) do its' worst to him... even to God! He's becoming a victim of the curse so that he might defeat the curse. Now, when death does its worst to us, the patterns of the world usually tell us that that's where it ends. "Death has the last word!" the systems of the world tell us. But the image of God on a cross is a profound challenge to the patterns of the world and to the assumptions of death's sovereignty. When death does its worst to God, "it was impossible for death to keep its hold on him" (Acts 2:24). God, on a cross, taking the sin of the world upon himself, gets the last word and death is thereby defeated. Thus, God invites us to live such a life that we are not bound by the power of death but have the freedom to follow Him to the cross. He calls us to go to the cross and to share in his solidarity with crucified people and to find life where the world sees only death. God invites us to see our faces on Jesus' face, just as we can see God's face, when we look to the crucifix. This gives birth to a new creation where resurrection, love, and forgiveness are the new "systems" of life. Celebrate resurrection but first, follow God to the cross. I (speaking for myself) don't see Christ's death on the cross as an unfortunate end, but I have to say that my theology of the Cross is in development. For that reason, I am probably a little more comfortable focusing on the resurrection. For many of us, substitutionary atonement theory was all we ever knew - there was no other way of thinking about the cross. So it is a good reminder to us not to abandon the cross because of theology that has been tied so closely to it in modern circles. Good thoughts and thank you! I probably should have credited your blog as inspiration for this post...especially since most of this post is from the comment I posted on your post.